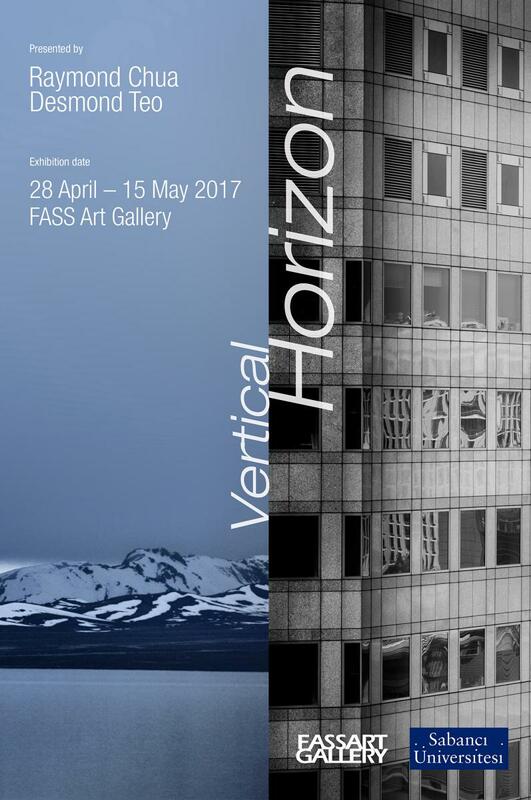 Vertical Horizon is a duo exhibit by Desmond Teo and Raymond Chua, Singaporean photographers who venture into the photography pathway since the early 80’s. Desmond’s photographs represent the contemporary images of the highrise and modern architecture buildings in Singapore. Some of these structures are not often visible without raising our head to look up because it is a densely-built urban cityscape. These reflective spaces arouses the viewer to critically perceive the reflected visuality afresh. What lies beyond and inside the glasses remains a puzzle to be explored. Clutterbuck’s (1998) notion of personal reflective space refers to our capacity to take issues forward in terms of the critical analysis and understanding that underpin reflective practice. Sometimes it is hard to differentiate, whether we are living inside or outside of the structures because we are surrounded and living in such concrete jungle. Fragmentation of urban life are framed in the indefinited, mirrored and diversified composition. These high contrast architectural photographs invites the viewer to critically question their own and others’ sense of identity in the city. On the other hand, Raymond’s earthy photographs depicted and mesmerized the exuberant landscape that we all struggle to protect and to treasure. Photographs seize an open space into a specific location; the earth’s surface is arrested as landscape. Photographs enfold reality; they turn into an act of colonisation (Wells 2011, p.56). The entrapment of a single frame of landscape would only allow viewers to see and understand a limited prospect compared to the photographer who has actually been to the site. The perceived subject in landscape photography is of course a subjective representation according to one’s knowledge, cultural background and preconceived ideas. Nonetheless, photography provides and extends our sense of knowledge, not only by bringing us to nature as a witness, but also sharing awareness of the human and landscape relationship, as well as geographical and historical facts. When humans continue to discover the undiscovered, the discovery usually leads humans to alter reality (landscape and landform) and push the boundary to a new horizon. The thirst for more and better, leads humans to a self-conflicting dilemma with the limited green. Many times, during the interventions between land and space which mostly resulted from human activity, we feel sorry, apologise, feel remembered and forgotten. In urban areas and cities, we may only find artificial green when new humanscapes continue to spread at speed, eliminating the natural green space. As humans colonised the land over and over, the modified landscape resulted in a paradox of the divine and the repulsive, serenity and agony.